Dimensions 2.25 by 7.50 by 9.50 in. Another gem from Herb Schildt--best-selling programming author with more than 2.5 million books sold! C: The Complete Reference, Fourth Edition gives you full details on C99, the New ANSI/ISO Standard for C. You'll get in-depth coverage of the C language and function libraries as well as all the newest C features, including restricted pointers, inline functions, variable-length arrays, and complex math. This jam-packed resource includes hundreds of examples and sample applications. 5th edition from McGraw-Hill Osborne Media (May 22, 2015); titled "C++ the Complete Reference"
4 sub edition from McGraw-Hill Osborne Media (December 1, 2002); titled "C++: The Complete Reference"
About: Explains and demonstrates aspects of the C++ language, covering topics including keywords, classes, inheritance, namespaces, the I/O library, runtime type ID, and the preprocessor. from McGraw-Hill Osborne Media (April 1, 2002); titled "C#: The Complete Reference"
About: Having written comprehensive references on other programming languages and a beginners' guide to C#, Schildt here takes the next obvious step. About: An updated new edition of the best-selling reference encompasses the latest features and functions of C, including those designed to facilitate 'embedded systems programming,' and discusses the development of the C interpreter code and its ability to enhance the functionality of the C language. 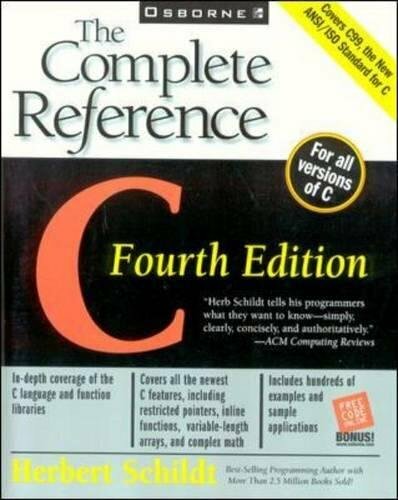 3rd edition from McGraw-Hill Osborne Media (June 1, 1998); titled "C++: The Complete Reference"
About: Author Herb Schildt is the world's best-selling C++ author with more than 2 million books sold. With Dan Margulis | 2nd edition from McGraw-Hill Osborne Media (April 1, 1995); titled "C++: The Complete Reference"
About: Find all the answers to your C++ questions in this conveniently organized and illustrated reference. About: Why mess around with any other C programming reference book when this is the only book you'll ever need?